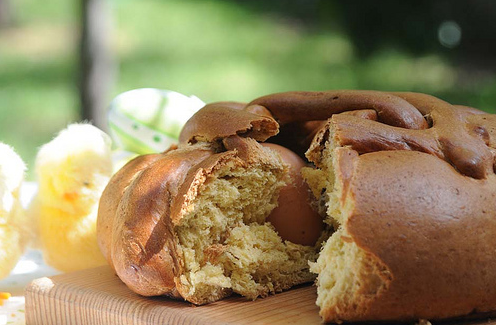 Folar da Pascoa is a type of symbolic Easter bread, which are traditional throughout many European countries with Catholic, Christian and Orthodox backgrounds. There are various different versions, but all seem to have the common theme of a cross or crisscrossed shape to represent the crucifixion of Chris. And many times, it encircles one or two eggs, representing rebirth or fertility. After conducting a little research, I’ve discovered that the Portuguese, Folar da Pascoa, is in a dead heat with the Italian version as the two most popular breads made internationally at Easter! In Portugal, there are two main regional versions: the basic northern version flavored with lemon and/or anise, and the very sweet Algarve version, which is more like a cake that resembles a cinnamon roll with allspice and caramelized sugar. Other versions include: candy-coated almonds instead of eggs or even ham as well. I prefer the northern version, of course, as it closely resembles my family’s recipe, only it uses lemon zest as the main flavoring instead of anise with just a hint of cinnamon. It also uses the hard-boiled eggs nestled within the bread, a tradition my family also used to do but not anymore. There are plenty of recipes found online to make your own Folar da Pascoa, but many Portuguese prefer to skip all the work and choose from one of the many pastelerias. A typical 8″ round bread costs between 10 and 15 euros and they are made fresh to order every day! Since I am most accustomed to my family’s traditional Easter bread, I went with buying one at one of my preferred pastelerias in the neighborhood, A Panificação Mecânica Lda. This very classical styled pasteleria, with its mirrored walls and crystal chandelier, is quite popular and has by far, some of the best quality selections around. Having bought my first Folar da Pascoa at this bakery last year, I loved how perfectly shaped and shiny it was on the outside, and ever so moist and fluffy on the inside. As soon as I got it back to the apartment, I fixed it up in exactly the same way I would have it for breakfast back before and savored its simple, yet divine flavors, that so closely resembled that of my family’s recipe. For a moment, it felt like I never left home! I continued to eat it for breakfast during the next four days over the Easter weekend, and by the following Monday, I had personally polished it off. This Easter, I will yet again be away from my family, but now I know I can still look forward to enjoying the Easter bread I have always loved, bringing me just a bit closer to home. However, as a sign of support, my mother has decided to make the Portuguese version alongside her Italian one this year. Thanks, Mom! Empty the baker’s yeast in a little bit of lukewarm water, let it develop a bit. Combine eggs and lemon zest and mix well. Add the flour with the sugar, cinnamon and a bit of salt. Slowly add it to egg mix. Knead very well with mild warm water until the dough comes together and off your hands. Let it rise and then form the folars into large, round balls, (about 6-8in. around) flattened a bit (make sure to reserve some dough for the crosses). Put one or two hard-boiled eggs into the center of each folar, and cross two strips of dough over the eggs and one wrapped around the cross. At this point you can let it rise once more for an even fluffier bread. Brush egg yolk over the folars and bake it on medium heat about 200C or 350F for 35 to 40 minutes. Local Hint: Boil the eggs with onion peels to get a better color.